While most of the focus this election season is on Congress, voters in 36 states will be deciding on who should be their governor. Republicans currently hold 26 of these seats, and it’s pretty clear that after Nov. 6, they will hold a lot fewer of them. It’s easy to overlook the significance of the governor races. Thanks to his unrelenting narcissism, President Trump has managed to make American politics all about him. By his own admission, the midterm elections are a referendum on his performance. However, the state-level elections are important in their own right. For one, governors determine how much, if any resistance to show to Trump administration policies. They also set the agenda for their state. That has practical implications for LGBTQ issues. Republican governors have been behind some of the most offensive laws targeting the community, including anti-transgender bathroom laws and religious right-to-discriminate laws. Coincidentally, those laws have had disastrous financial effects on the states. There are three openly LGBTQ Democrats running for governor this year. 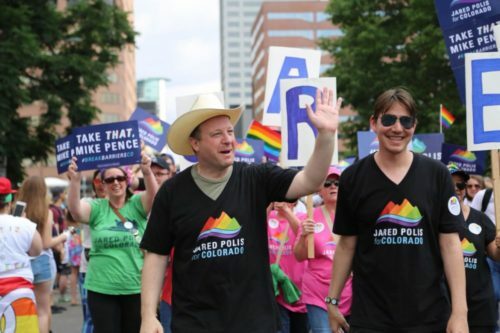 Jared Polis is leading in polls in his race to become the governor of Colorado, having served five terms in Congress. Should he win, he will be the first openly gay governor in U.S. history. In addition, Oregon Gov. Kate Brown, who is openly bisexual, is locked in a tight race for re-election against Rep. Knute Buehler. Bucking his party’s position, Buehler has been courting the LGBTQ community, saying that he has “long supported gay rights.” Texas Democrats have nominated lesbian Lupe Valdez, but Valdez is facing an uphill battle in her race. Most other races feature a stark choice between the candidates. Chief among them is Wisconsin, where Scott Walker is seeking a third term as governor and learning that three may not be a charm. Walker has always been an opponent of LGBTQ rights in a state that was a pioneer in them. As a Republican with national ambitions, Walker staked out the standard GOP positions: opposition to marriage equality, criticism of the Boy Scouts for allowing gays to join, and an affection for anti-transgender bathroom bills. In a closely divided state, he’s been able to squeak by in elections (including a recall election), all the while stacking the deck in favor of the GOP. Walker’s presidential campaign in 2016 fizzled, and it’s increasingly looking that his next gig will be as a Fox News contributor. His Democratic opponent, Tony Evers, is the state Superintendent of Public Instruction. Evers isn’t overflowing with charisma, but he has run an effective campaign. He has used his position to underscore the need to support LGBTQ kids. Evers has been leading in polls, causing Walker’s biggest boosters, the Koch brothers, to sink millions into his re-election in an effort to shore Walker up. The fact that Walker is in trouble underscores the unfriendly landscape for Republicans. But Walker is hardly alone. In multiple states where Republicans should be coasting to victory, polls show tight races. In Georgia, Stacey Abrams, a self-proclaimed progressive, is waging a strong campaign against Brian Kemp, who never met a far-right position – including an anti-LGBTQ one – he didn’t like. In Kansas of all places, moderate Republicans are throwing their support behind Democrat Laura Kelly, who is running against Kris Kobach. Kobach made a name for himself promoting voter suppression efforts, with a sideline in anti-LGBTQ hatred, but Kansans have soured on radical GOP policies under former Gov. Sam Brownback, which caused the state economy to tank. Kelly is virtually tied with Kobach in the polls. While stemming the red tide would be satisfying from a policy perspective – to say nothing of sending Trump a message – that’s not the only reason why Democrats want to win. Also at stake in the election is a lesser known but politically crucial matter: Congressional districting. With a Democratic governor, the party has a better chance of drawing maps that reflect actual party distribution. It may sound boring, but better maps would effectively take GOP thumbs off the scale that tilt elections in their favor. That would have an effect well beyond this November.